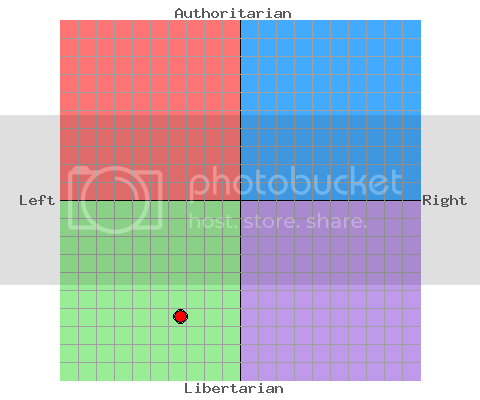 I'm just a bit more to the center than Roots, the total opposite of my Prime Minister, Stephen Harper. A bit closer to Stalin the Jetryl is. Oh joy, another political compass topic. One square to the left, two squares up, about. I didn't bother to grab a link, since having so much specificity in the measurement when the number of sig-figs is probably about one bugs me. I believe strongly in the free market, less government control, and social morality set as a universal construct on the golden rule rather than social-political law. The mild libertarianism I can see, but why am I centrist economically? Weird. I did this one long time ago. It seems like I got even a bit further liberal. Meeh I'm getting old.